“MMP, the world’s only 5th Generation anti-tank guided weapon, now in service within the French Armed Forces, has been developed for both mounted and dismounted applications and is suitable for unmanned ground vehicle (UGV). 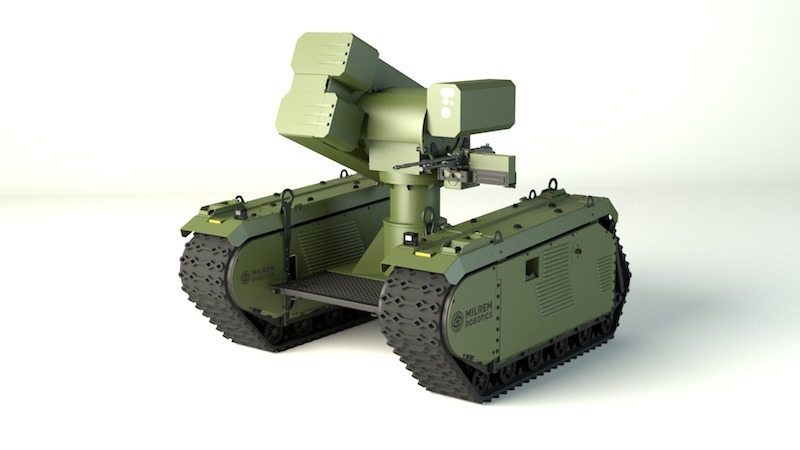 With its 4km+ range and its two firing modes – lock on before launch (LOBL) and lock on after launch (LOAL) – the MMP gives to THeMIS UGV an unmatched capability to engage a target beyond line of sight. “MMP allows, within remote operation, to engage very discreetly battlefield targets at ranges greater than the enemies counter fire, from behind cover and within structures in fighting in built-up areas. The MMP Firing installation deployed on UGV also provides an ISTAR (Intelligence, Surveillance, Target Acquisition, & Reconnaissance) capability and, through direct integration with a C4I network, delivers battlefield intelligence out beyond the platoon”, added Col (ret’d) Francis Bordachar, military advisor of MBDA.